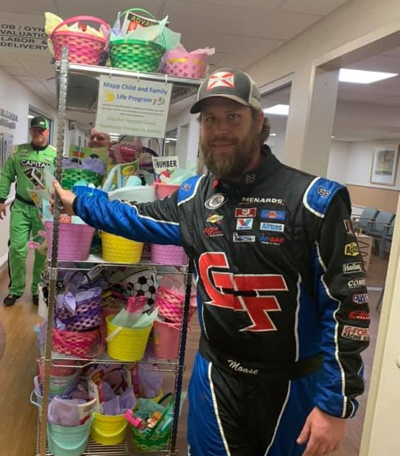 In what has become an annual tradition on the Gulf Coast, Thomas “Moose” Praytor took part in the Kane’s Warrior Kids Easter Basket drop at USA Childrens and Womens Hospital in Mobile. “After all the years traveling with the ARCA Series we were finally able to be at home to take part in Kane’s Easter Basket Drop. Derek and his Kane’s Warrior Kids Foundation do a tremendous job working with sick children,” said Praytor. The Moose has a long history with USA Childrens and Womens Hospital, he and his twin sister were born there, spending their first few weeks in the USA Neonatal Intensive Care Unit (NICU). Praytor made a return trip to USA 13 years later, via helicopter, after being knocked unconscious while racing at Sunny South Raceway. Praytor was one of four area drivers participating in the Easter Basket Drop, Derek Long, Barrett Bischoff and Monte Skinner were part of the delivery team. The countdown is on, with just 10 days before the Moose returns to ARCA action at Talladega Superspeedway in the General Tire 200, live on FS1 at 5:00 PM CST.